Suggested Room Size: 100 sq. ft. 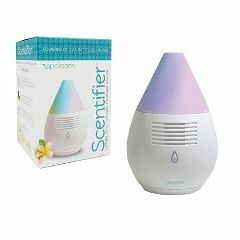 Bold performance with a silent fan to diffuse your choice of essential oils. Operates on 4 AA batteries (not included). Complete with USB cord and 3 replaceable absorbing essential oil pads. Unique design boasts therapeutic color with revolving LED lights.